← Who Do You Write Like? 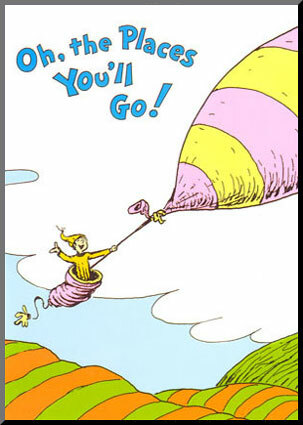 is not easily done…Step with care and great tact and remember that Life's A Great Balancing Act…you're off to Great Places! Today is your day! Your mountain is waiting. I don't know what is behind your posting this today (although I can imagine) but the timing is perfect for me. Thanks. jbchicoine said, Jon Paul! Is it really you? So glad to see you, even if it's part of the ups and downs of 'climbing mountains'. New chapters are never easy transitions. Been thinking about you and hope you are well, overall. Things have been very hectic in my life lately, but I'm beginning to feel ready to resurface again. Not happy about the unanticipated absence from cyber life, but we all do what we can, right? I'll see if I can get a note out to you and the others in the next few days to re-engage. Hope you are well too! A.T. Post said, My folks gave me this book…when I graduated high school. I thought it was the most apropos gift I ever received. DL Hammons said, Glad to see you back JP! You'll catch us up soon…right? justsoyouknow said, I love the second stanza, it teaches ti stand on our own and use the wit and abilities God has given is in our decision-making.